Table top games can range from simple to incredibly complex. I usually pick games that are somewhere in the middle. These games have specific rules to follow, but you can usually grasp them within a couple turns of playing the game. The games I list below will mostly be in this category, and are perfect for a family or group of friends who’ve played Monopoly a few too many times. Settlers of Catan is sometimes considered the game that sparked the new wave of tabletop games. It would probably be the most familiar to Monopoly, in that it focuses a lot on resource development, trading and occasionally messing over your opponents. Catan was my introduction to the wonderful world of tabletop games. The rules are pretty straightforward: you and your opponents are, well, settling the island of Catan. Wherever you build your settlements are where you will be collecting resources from, which in turn allows you to build more roads, settlements, and so on. Much like Monopoly, the most ruthless players can get a leg-up on others, especially if they’re good at negotiating. I’ve played games with friends that have been tense with suspicion, backstabbing and the frequent bickering. It relies a little too much on having a good run of dice throws, hence why it’s at the bottom of the list. However, the island is customizable, and expansions add new and more challenging aspects, such as multiple islands, barbarians, pirates and more. The most recommended expansion is the Seafarers expansion, which opens up multiple islands and ocean trade routes. In Carcassone, you work against other players to build a map of towns, roads and farms out of a bag of tiles. It’s surprisingly relaxing, and building your set of connected roads and towns is surprisingly satisfying. Easily one of the most accessible and most appealing tabletop games out there, Ticket to Ride is a fantastic introduction to modern tabletop games. The rules are simple enough to grasp within a few turns of playing, but there’s a hidden element of strategy as you and 3 other players build your railway empire over a map of early 1900s North America. 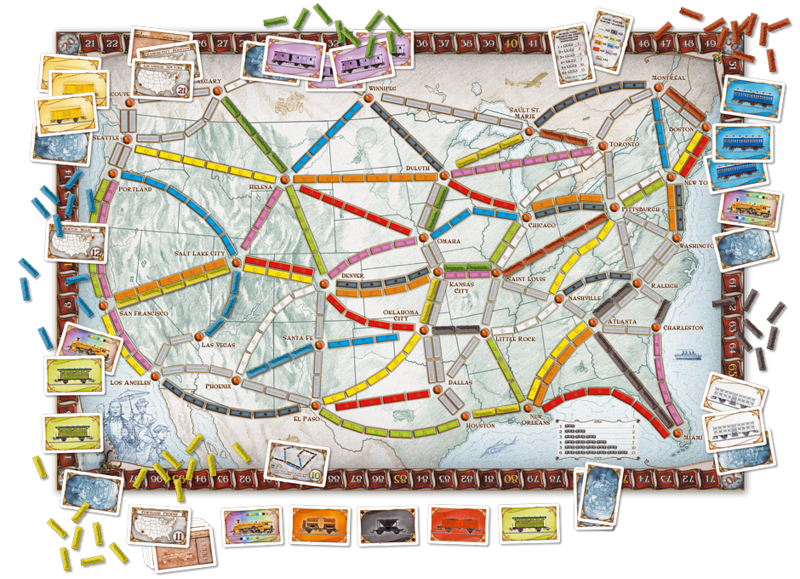 The game works using train cards, which you can collect each turn and use to build railways. Your “tickets” are major routes between two cities that, if connected, net you a lot of points—but if you fail to connect them, those points are deducted from you at the end of the game. Growing up, we didn’t play a lot of board games in my house. But when I introduced my Dad to this game he just became absorbed with it. Now almost every time we visit, we’ll break out Ticket to Ride, or the Europe expansion, and usually about halfway through we start trying to cut off each other’s routes. I’d say that if you had to pick one game as a trial to replace Monopoly with, Ticket to Ride is the way to go. In Tsuro, players place tiles with connected paths on a grid and move their character along the path. It’s very quick to play, easy to understand, and includes some light strategy because you can send your opponents off the edge of the map—or crash into them if you’re not careful. Sushi Go is what’s called a draft-building card game. Everyone starts out with a hand of cards, picks the one they want, then passes the rest of their deck to the person beside them. Not all cards are equal, obviously, and some require you to plan ahead or change your strategy if you want to succeed. 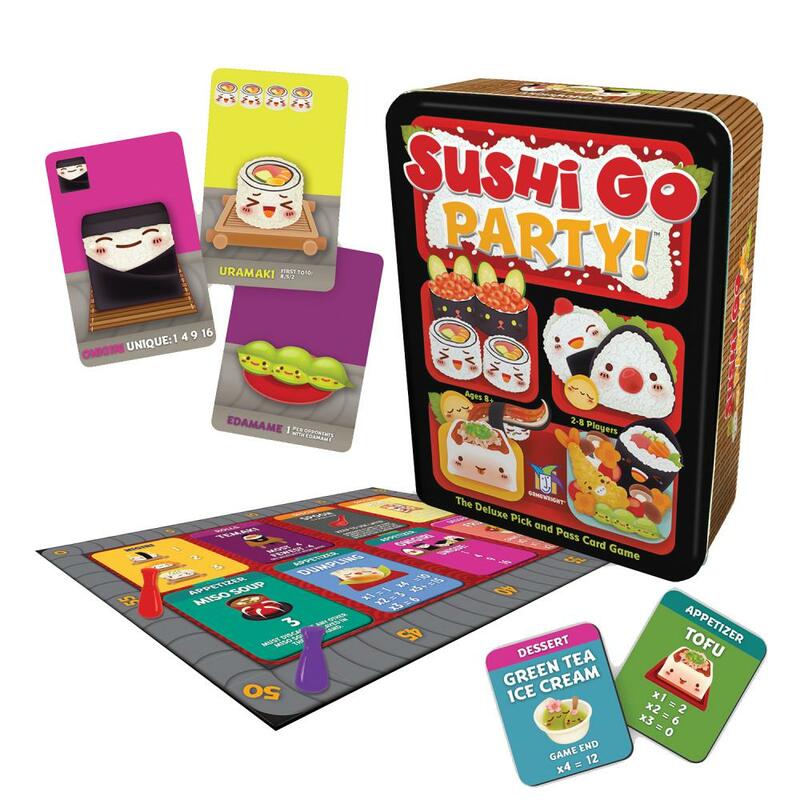 An expanded version of Sushi Go, the Party edition adds a board, many additional cards, and a “menu” system that allows you to customize the cards in the game deck, adding or reducing complexity depending on the cards you choose. It can be played with several people and is a really lighthearted, relatively quick game to play. Plus, I mean, just look at the artwork: it’s just so freaking adorable. Arctic Scavengers is a deck-building game where you and other players act as a leader of a post-apocalyptic tribe, and you must scavenge the wastes for resources and fight other players for contested resources. The game is usually bundled with its 2 expansions, which add more complexity and variety to the game. There are a lot of party games out there that can be scaled up, depending on the number of people playing. Some are on this list, others include Apples to Apples and 5 Second Rule. But one of the most clever is Codenames. In this game, you are split into 2 teams. 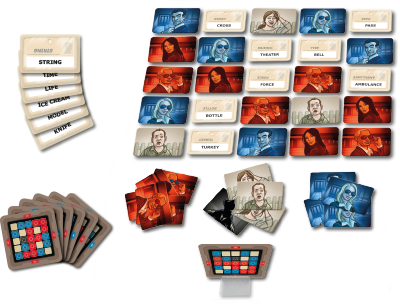 Each round, 25 codename cards are put in the field, and the Spymaster has to give his team clues as to which agents are on their team. Clues consist of a single word, and the number of agents on the field that relate to that word. For instance, if you have agents named “Cloud”, “Rain” and “Bird” your clue could be “Sky: 3”. It helps if you’re playing with friends you know well, because then you know what references will work with them (for instance, on time my friend had an impressive play by just saying “Miyagi 3”, and his team was able to get all 3 agents based on Karate Kid references). Another fun group game, in Scattergories you work in a team to come up with a list of words based on a letter. You are given a card that has a list of 12 random categories and you have to come up with a response to each of them using a word that starts with the chosen letter. Imagine the big, cheesy kaiju movies of the 60s (usually Godzilla VS Whatever) and now imagine that you get to play as one of those monsters and battle other monsters for control over Tokyo. 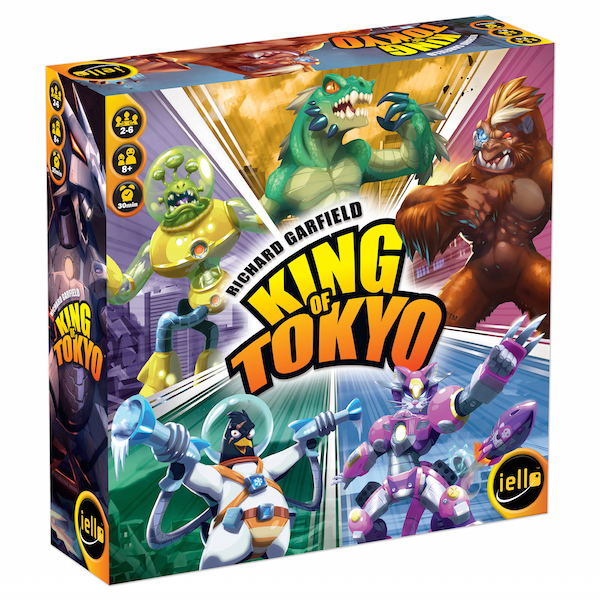 That’s King of Tokyo. It’s goofy, and the artwork is charming (I particularly like Space Penguin), and its “King of the Hill” style gameplay is one you don’t see very often in board games. You can spend energy on upgrades from a deck of cards that act kind of like an upgrade store. You have to know when to cut your losses, because while you are in Tokyo all the other monsters can attack you and you can’t heal. You can give up your spot to any attacker, putting them in the hotseat while you heal. I’d say the only downside is that once a monster is defeated, that player has to sit out of the rest of the game. Century: Golem Edition is a resource-management game where you try and trade up or change your resources to purchase helpful stone golems. The artwork alone is charming enough to make the game worth it, but the gameplay is also fun and engaging. I’m a sucker for word games, and Taboo is all about word guessing. 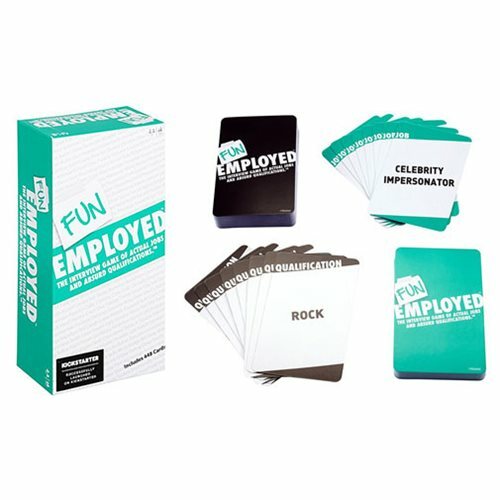 Like Funemployed above, it can easily be played in large groups, and is meant to be played in teams. With each round, teams select one player who has to get their team to guess the words printed on a set of cards. The trick is that they can’t use one of the “Taboo” words printed underneath the word on the card. They have to get through as many cards as they can in 60 seconds. The stress of the timer, as well as the taboo words, make this a tense game, especially for the poor sucker at the front who has to try and describe a word to their team. You have to get creative and think on your feet, but the results are usually hilarious. Basically this is Charades: The Board Game. You play on a board of icons and images, and use coloured cubes to highlight certain concepts that make up a word. It sounds boring, but requires a lot of mental gymnastics on the part of the silent player who is trying to form a word using only cubes on icons to represent a concept. Out of all the games on this list, Funemployed is definitely the one I’ve laughed the hardest while playing. The gist is that you apply for real-world jobs with absurd qualifications. The game consists of 2 decks of cards: job cards and qualification cards. Each turn, one player acts as the manager, interviewing the other players who have been given a hand of qualification cards, and then deciding who is the most qualified. The fun of the game comes from trying to justify your qualifications for each job. You could be applying for the job of flight attendant, but your qualifications are “kleptomaniac”, “Russian accent”, “fluffy” and “literally the worst”. Or perhaps you are applying to be a singer, but you are a cyborg alien who has gas. This game is great for larger gatherings. For families, it’s worth noting that some cards lean a bit on the inappropriate side (it is rated 18+ after all), but they can easily be taken out of play. Who would win in a fight between a lightsaber-wielding Barack Obama and Spiderman inside a giant hamster ball? In this game, two players draw cards to form their own bizarre fighter, and then each has to justify to the rest of the players why their fighter would win. As with Funemployed, families should go through the cards first to see if there’s any cards they would like to remove from play. One thing I appreciate about a lot of the new board games coming out is that there’s usually an interesting blend between a game’s mechanics and its theme. What I mean is that the setting, characters, and events in a game tie in with how the game is actually played. This is very true with Photosynthesis. 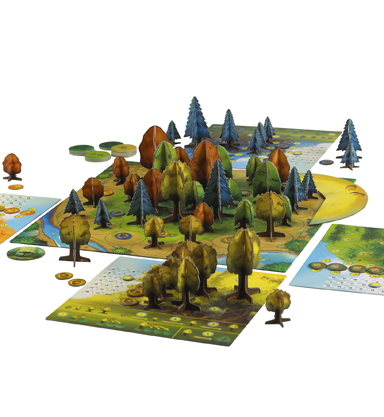 It’s a game that, on paper, doesn’t sound very exciting: you play as trees, and your goal is to spread your seeds, harvest the maximum amount of sunlight to grow and, at the end of a tree’s lifecycle, get cut down for points. Yet the game quickly evolves into a strategic game of knowing how to spread your seeds closer into the board, where there are more points, while also cutting off sunlight from your competitors and knowing the best time to cut down your trees. Every round the sun moves around the board, and taller trees cast shadows over smaller ones (including your own). I think what impresses me most about Photosynthesis is that once you grasp the rules, it just kind of makes sense. Trees sprout from other trees, need sunlight to grow, and from the sunlight you gather you can “purchase” more trees and seeds to use. There’s no boosts, no extra perks, no luck involved: just pure strategy. Quantumis the priciest game on this list, an arguably the rarest, but it is definitely worth it. It’s a strategy game where you control a fleet of ships, represented by large dice, and are trying to harvest energy from planets in the galaxy. Each side of the dice represents a different class of ship with a different ability, and you are able to develop your faction as well as the game progresses. 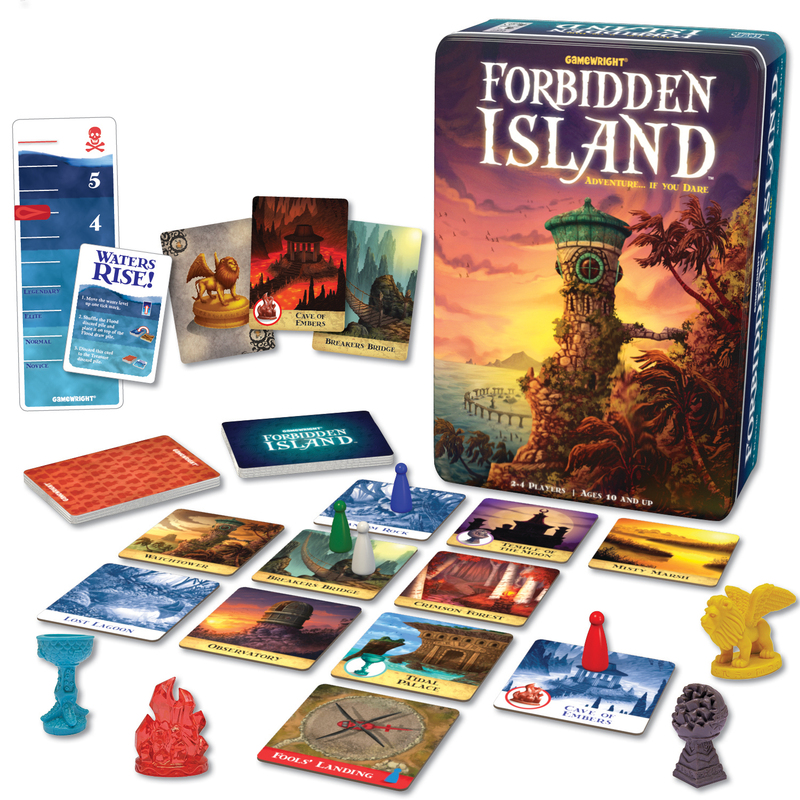 Forbidden Island was the first board game that my wife and I got in to. What’s interesting about this game is that you are actually playing against the game. You and the other players have to work as a team to hunt down treasure on an island which is gradually, tile-by-tile, sinking into the sea. You have to cooperate and strategize together in order to survive, and it’s likely that your first few games will end with you and your team mates sinking along with the island. There’s been several times that I’ve played this game and sometimes winning or losing comes down to a single turn. I actually find Forbidden Desert to be the more enjoyable game, but its rules are a bit more complicated than Island and so its better to familiarize yourself with how Island is played before moving up. Basically, you and your fellow players are stranded in a desert and need to find parts to a finding machine buried in the desert. The mechanics are very impressive, including a raging storm that shifts every turn, burying other players and objects and hindering your progress. There’s a reason that Pandemic is considered one of the best games ever made. It is a cooperative game in which you and up to 3 friends must work together to find cures for 4 deadly diseases that are spreading out of control across the world. Teamwork, strategy and communication are a must as you work to cure and contain diseases. You play against the game and, like Forbidden Desert, you will most likely fail the first couple of times. Players are given a character, each with special skills, and using these skills is essential in learning how to beat the game. You must communicate and plan with other players as you each spread out across the globe, containing outbreaks and curing hotspots, but with each turn you’re in risk of triggering an Epidemic. When that occurs, diseases intensify and spread to other cities, which can easily trigger a chain reaction of outbreaks that can cripple your game unless you’re playing smart. Of all the games in my collection, this is the one I recommend above all others and the one I’ve played the most. Every game is different, especially if you’re using different characters and different difficulty settings. It’s expertly designed and, above all, it’s fun and intense. 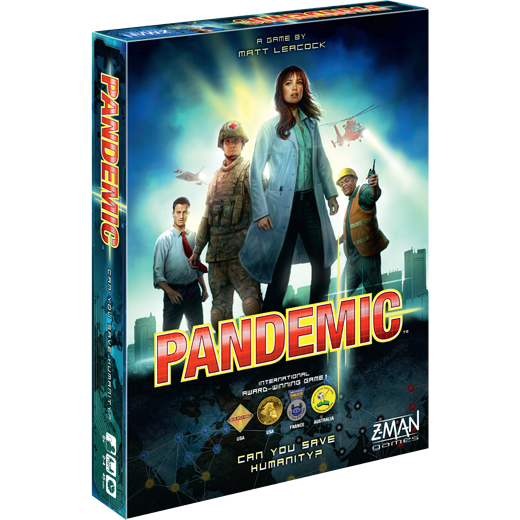 Pandemic has a lot of expansions and variations, but the one that is often most recommended is On The Brink. This expansion adds a 5th disease, extra characters, new epidemic cards, and the ability for a player to play as a bioterrorist who works against the players by spreading diseases around the world.